Will Brazil's political upheaval tear down years of rainforest growth? BRASILEIA, Brazil – Rosildo Rodrigues spent the month of September trekking to remote outposts in the Chico Mendes Forest Reserve in the Amazonian state of Acre and in early October, his hard work paid off. The former rubber tapper was re-elected to the city council in the sparsely populated municipality of Brasiléia, near Brazil’s border with Bolivia. At a celebration barbecue, he hugged and shook the hands of his supporters ­– largely rubber tappers, nut collectors, and other small-scale forest extractivistas. “You can count on us,” he told them. But he has his work cut out for him. For the families that voted for Rosildo, the political stakes feel higher than ever. Rosildo is a member of the Workers’ Party, commonly referred to as the PT (Partido dos Trabalhadores). The party was once the largest left-wing political movement in South America and its first president, Lula da Silva, remains one of the most popular political leaders in the country’s history. But the party has been thrown into a major crisis, culminating with the controversial impeachment of president Dilma Rousseff early in September. When Rousseff’s center-right vice president, Michel Temer, took the reigns of the stumbling administration, he appointed an entirely new cabinet and promised to cut social spending and government regulation. In local elections, just weeks later, the PT lost 60% of its representation in mayor and city council seats. For Rosildo and his supporters, the shift threatens the social and environmental agenda of a party that improved the quality of life of residents in the Chico Mendes reserve. Programs implemented by Lula and Dilma administrations have provided electricity, roads, schools and previously lacking sanitation. Analysts and residents have also indicated that the Amazon, a major natural resource on which they all rely, could also be impacted by a political shift to the right. "Clearly, the PT identified with the extractivists in a much stronger way than the current government," said Mara Freire Rodrigues de Souza, a doctor of forestry policy and a partner at the environmental law firm Rodrigues de Souza Advocacia. While the environmental impacts of a Temer presidency are yet to be seen, Souza said, cuts to environmental spending were unlikely to be an exception to across-the-board austerity measures. And while less priority given to the environment would likely affect all Brazilians, she added that traditional communities, especially those without special legislation intended to protect them – like indigenous and quilombola communities – would fare even worse. "Traditional communities that live on the interior part of these [conservation units], largely those who are the most isolated, they are basically on their own," she added. "And in times of crisis, whatever was already bad will only get worse." Rosildo Rodrigues at a church service in the Chico Mendes Forest Reserve in the Brazilian state of Acre. Deforestation in the Amazon rainforest declined sharply during two consecutive Workers’ Party administrations: A simple truth that propelled the PT into a favorable position among many extractivistas and other community members that depend on the forest for their survival. Both PT administrations implemented subsidies for environmental conservation, programs to encourage the sale of forest-friendly products, and programs to incentivize the purchase of food from local farmers like those in Chico Mendes. But amidst political instability of historic proportions, some government programs that many reserve residents rely upon are already seeing cuts. The Ministry of Health, which has for many years bought rubber from the tappers’ cooperative to make condoms, announced recently that it would be suspending rubber purchases, putting the annual contract in jeopardy. In the meantime, deforestation in the Amazon is again on the rise. In 2015, Brazil made headlines as the acres being cut in the rainforest jumped 16% from the previous year. The upward trend is likely to grow more severe in coming months and years, as the new ruling government is expected to cut the budgets of the agencies responsible for monitoring and mitigating deforestation in the Amazon – namely, the Brazilian Institute for the Environment (IBAMA) and the Chico Mendes Institute for Biodiversity and Conservation (ICMBio). According to Anselmo Gonçalves, who works with ICMBio in Brasiléia, “environmental policy in Brazil is comical.” ICMBio is responsible for managing federal conservation units around the country, including extractive reserves, national parks, and biological conservation areas. But on the national level, Gonçalves believes the national discourse of environmental protection is rarely met with sufficient allocations in the budget. Part of ICMBio’s mandate includes the regulation of environmental violations such as deforestation. In all of Acre, ICMBio has only 10 employees tasked with the job, despite the fact that nearly 25% of the state falls within their watch area. IBAMA shares some of this responsibility, but they are also understaffed. They respond to environmental crimes across the state and, given that such violations often occur in remote, hard-to-reach areas, they often arrive too late or only prioritize the most severe violations. Rural Brazil has a long-standing relationship with the Workers’ Party and Acre, located on the far western edge of the country, is no exception. Beginning in the 1970s, rubber tappers in Acre clashed with newly arrived ranchers who wanted to clear forest for cattle pasture. The tappers unionized and violent confrontations became common. 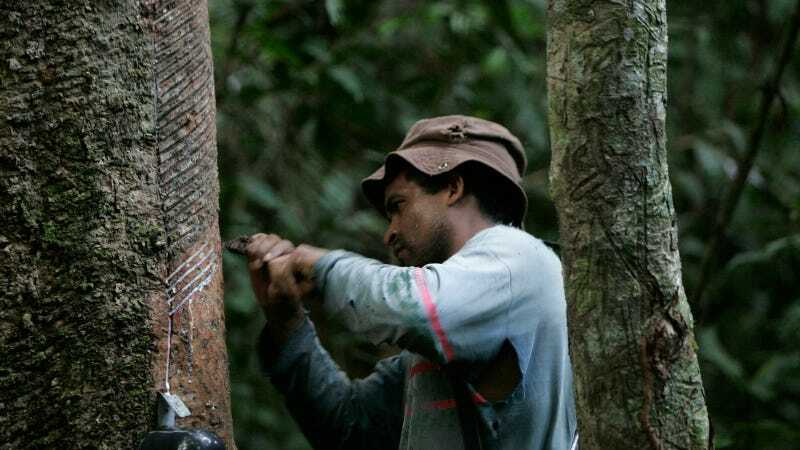 By 1988, when the Brazilian constitution was signed, the unions successfully lobbied for the creation of extractive reserves where families of rubber tappers would be permitted to live in the forest, practicing activities considered to be traditional and environmentally sustainable. The movement was led by Chico Mendes, a well-known labor and environmental activist from the state of Acre who was killed by ranchers shortly after the law was passed. Today, the agency that protects the reserves and the Chico Mendes reserve, deep in the state of Acre, carries his name. It is a history of hard-won victories that is not lost on Rosildo, a former rubber tapper and former president of the Rural Workers’ Union in Brasiléia. Both his father and grandfather helped to found the union in 1974 and they worked closely with Wilson Pinheiro, the president of the union that was killed inside its headquarters in 1980. The first time that Lula Da Silva visited the reserve ­– then as president of the Unified Workers’ Central (CUT) – was to attend Pinheiro’s funeral. On one of his recent campaign trips into the reserve, Rosildo sat huddled among residents in a small house. Late into the night, he listened to their concerns about roads, lacking infrastructure, and the floundering price of rubber. When the group slung hammocks and turned in, the 52-year-old was beaming. The next day, his team would have coffee at the home of another resident, attend church with community members, and join supporters for a barbeque. "Politicians think that rubber tappers talk, but that they have no bite – that they are puppies," Rosildo said to members of the reserve, gathered at a local meeting. "But we're here because we believe in democracy," he said, and referring to the new government's agenda, he added: "We cannot let this go forward." Last Sunday, his efforts paid off. At least for now, reserve residents are left with some hope that the environmental and social policies on which many have come to depend will remain intact for at least a little bit longer.